The trail began with a commitment to provide a service and to be an educational resource to the residents of Eagle. All of our work is accomplished through donations from businesses and individuals in the area. Much of our work can be accomplished by volunteers; however, some of the work must be done by trained professionals whom we hire. Please consider donating to our trail work. All donations are fully tax-deductible. Checks can be made to Alice Baker Library/Eagle Nature Trail. and sent to Eagle Nature Trail, P.O.Box 295, Eagle, WI 53119 Attn: Jean Weedman. All donors receive an acknowledgement letter for tax purposes. Fundraiser: If you’d like to have your own Aldo Leopold bench, we make and sell them to raise money for our trail work, $100 each. 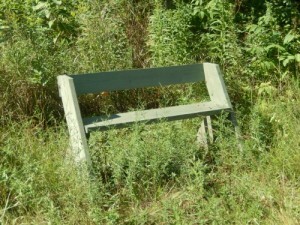 To order your bench, call 262-594-5996 or email weedmantandj@aol.com . The Eagle Nature Trail Committee wishes to thank the following donors who have contributed needed resources — whether money, equipment, professional services, reduced costs for products or services. Brittenham and Hixon Lumber Co.
We regularly update this information. Please make us aware of any additional donations at email address: weedmantandj@aol.com.